Chalo beauty signs yet another biggie? It looks like there’s no stopping Rashmika Mandanna, the Kannada starlet who has made an impressive debut with Naga Shaurya’s latest hit Chalo. Already, Rashmika is acting alongside Vijay Deverakonda in a film being produced under Geetha Arts 2 banner. She’s also said to be the leading lady in Vijay Deverakonda’s next film under Mythri Movie Makers’ production. 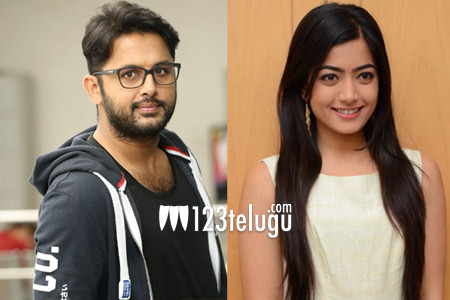 Now, as per the latest reports, Rashmika has been roped in to play the female lead in Nithiin’s soon to be launched family entertainer, Srinivasa Kalyanam. This film will be directed by Shatamanam Bhavathi fame Satish Vegesna and produced by Dil Raju. An official announcement regarding Rashmika being part of the project is awaited. Ekkadiki Pothavu Chinnavada actress Nandita Swetha is the other female lead in the movie. Stay tuned for more updates.